The International Monetary Fund (IMF) decided on Thursday, July 17, that the Ukrainian government should not receive a new transfer of $1.4 billion, as previously scheduled on July 25. Instead, the IMF agreed with officials in the government of President Petro Poroshenko and Prime Minister Arseny Yatseniuk that they should spend several more weeks improving on their accounting of how they have spent the first $3.2 billion of the IMF’s Stand-By Arrangement for Ukraine, paid out on May 6. Measures were required, the IMF warned Poroshenko and Yatseniuk, to halt the haemorrhaging of IMF cash out of the Ukrainian budget — and of capital from Ukrainian banks and corporations out of the country. Gueorguiev’s reference to “weeks” of delay meant the IMF was unready to accept that the vanishing first tranche of $3.2 billion has been spent on war in the east. “Weeks”, in Gueorguiev’s statement to Reuters, meant that without Ukrainian accounting compliance, the risk and suspicion remain that Ukrainian insiders have been trousering the IMF money and sending it offshore. Reuters bylined Gueorguiev’s disclosures in Kiev, and gave the initial time of publication as 0542 on Friday morning, Washington time. 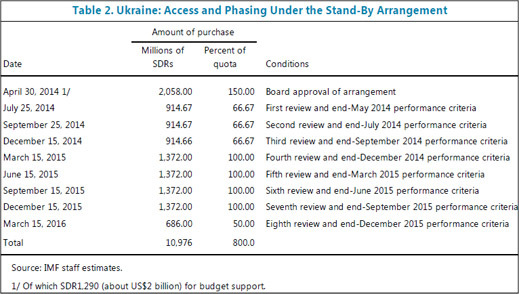 The July 25 deadline, and the IMF’s conditions required for the Kiev government to qualify on time, can be found here. On June 4 Gueorguiev announced the IMF would make public the Fund’s control standards and auditing requirements. Since then the IMF, the Ukrainian Finance Ministry and National Bank of Ukraine have not published these details. An official statement issued by the IMF in Washington during Friday afternoon was headlined: “IMF Announces Staff Level Agreement with Ukraine on First Review under the Stand-By Arrangement”. But the text which follows says nothing about releasing the new cash. 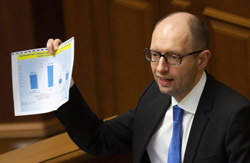 Instead, the IMF reveals that the Ukrainian government was spending more budget money than it had earlier agreed with the IMF; collecting much less revenue in tax and debt arrears from the country’s private corporations; allowing concealed subsidies for gas which have been prohibited; and letting capital move offshore at a growing pace. And there’s the rub: what have Gueorguiev, senior management at the IMF, and the governments which sit on the IMF board decided about the terms and conditions the Poroshenko-Yatseniuk government in Kiev should meet? 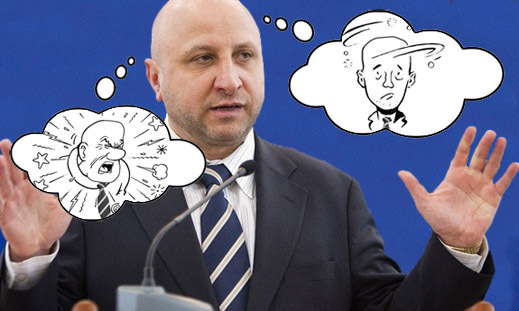 Gueorguiev was asked to explain how it happened that he had told Reuters the IMF was “weeks” away from deciding on the release of the second tranche, but that, according to the Bloomberg report the “weeks away” decision had been taken already. What had happened last Friday, he was asked, for IMF senior management to change the timing he had announced. Gueorguiev responded with an automatic email: “I am out of office until July 18. Time difference, work load, or connection problems may delay my response.” Four days later Gueorguiev was still delaying his reply.